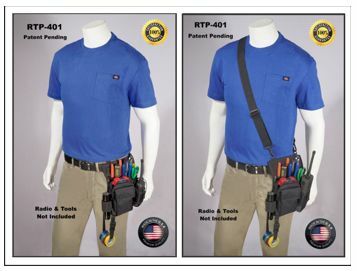 The RTP-401 allows you to carry your two way radio and essential tools in one of seven different pockets or pouches. 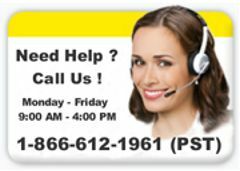 The holster's universal sizing capabilities for the Radio and Flashlight mean you can carry with confidence knowing it will work with your existing equipment. 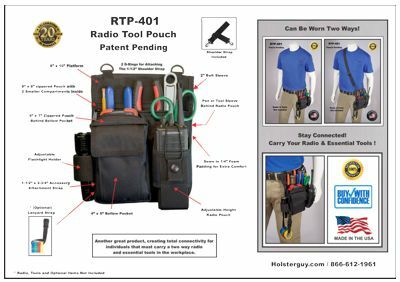 The Radio Tool Pouch can also be worn with a belt or the supplied ANSS-104 adjustable nylon shoulder strap. Can be worn on a Belt or the Supplied Shoulder Strap!